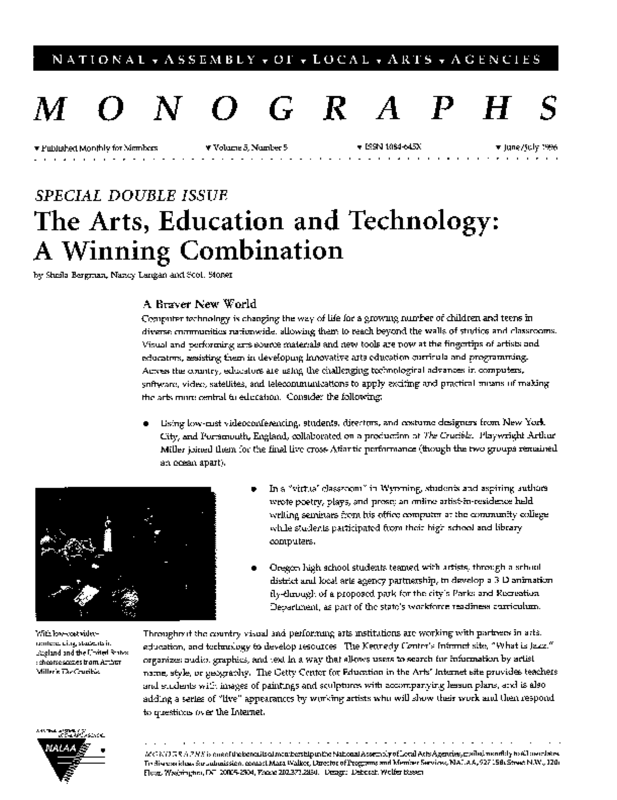 This issue of Monographs provides profiles of how local arts agencies, arts organizations, and educators are incorporating new technologies into their already-existing programming and curriculum. The Arts, Education and Technology: A Winning Combination highlights examples of how locally, the arts community and schools are forging new collaborations with patterns such as libraries, universities, public access television stations, cooperative education agencies, and businesses to link arts and technology to the classroom. Funding trends are discussed by Arlene Krebs, author of The Distance Learning Funding Sourcebook. In the resource section is a list of publications and online websites. Believe it or not, this braver new world of technology can be demystified. Copyright 1996 Americans for the Arts. All rights reserved.